January 2011 Archives - Newman Dignan & Sheerar, Inc. - Providence Fee-Based Financial Advisors January 2011 Archives - Newman Dignan & Sheerar, Inc.
We ended the week on a volatile note as the Middle East, namely Egypt, rattled the markets. Taking Friday’s action into consideration, the markets are still mostly positive year-to-date with the DJIA, the Nasdaq, and the S&P 500 up 2.1%, 1.3% and 1.5% respectively. The Russell 2000 is down 1.1%. The U.S. appears to be in a more self sustaining expansion as we saw GDP growth accelerate in the fourth quarter to 3.2%. Earning season continues this week however most major companies have already reported. 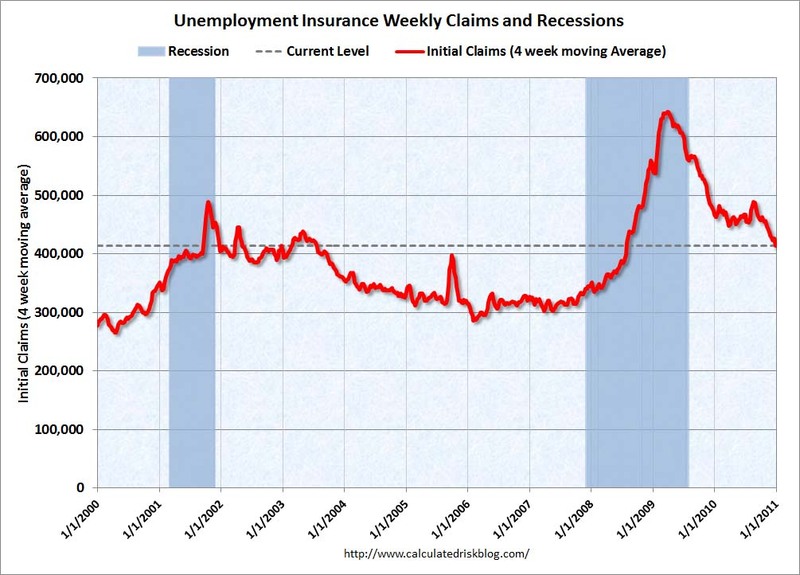 Friday’s employment situation is in focus as the jobless claims continue to improve, albeit with a lot of noise in the weekly claims. Markets last week were mixed, with the DJIA advancing 0.7%, while the Nasdaq, the S&P 500 and the Russell 2000 all declined by –2.4%, -0.8% and –4.3% respectively. Earnings reports were mixed, with GE’s positive surprise only partially offsetting disappointments registered by BAC and FFIV [reining in the cloud computing euphoria]. The week ahead includes earnings and non-earning events of note. The earnings calendar includes MCD MMM AXP EMC JNJ VZ BA T CL MSFT CVX and Ford. The State of the Union and the Federal Reserve meeting on Wednesday will also be important. Finally, manufacturing activity in the US is quietly expanding. Capacity utilization rose by 0.6% in December to 76%. This is producing manufacturing employment increases, and has plenty of runway ahead of it [the average since 1972 is 80.6%]. Last week the DJIA rose 0.96%, for the seventh consecutive weekly gain, to close at a 2½ year high. Look for a blizzard of earnings reports this week starting with Apple on Tuesday, although Apple’s earnings maybe overshadowed by the announcement that Steve Jobs is taking a second medical leave, and finishing with GE’s earnings on Friday. 4th quarter earnings reports should provide further support for the stock market this week. 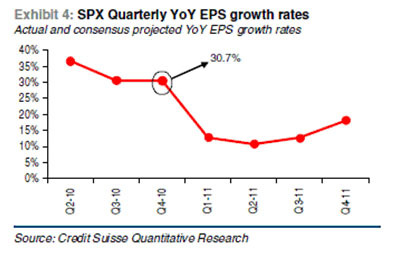 The chart below illustrates the current quarterly year over year estimated earnings growth rate of 30.7% for the S&P 500. We read with interest today a survey of 140 institutional money managers that was conducted by Morgan Stanley Smith Barney. While it is unsettling to be part of a consensus, many of their conclusions dovetail with our findings. 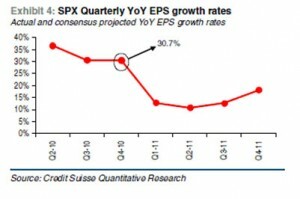 Earnings are expected to be up in 2011 by 11% versus bottoms-up forecasts of 13.4%. S&P 500 go ahead is projected at 9%, with more participants expecting 20%+ up versus down. Large-cap stocks are projected to outperform small and mid-size companies, and growth stocks to outperform value(this by a very wide margin). Finally US stocks are projected to outperform international. It’s not a bad way to approach the market as we enter 2011! The week ahead gathers steam as the world returns to work following the holiday season. In focus will be updates on the following: US Manufacturing, US Non-Manufacturing (Service sector), the state of the consumer (Consumer Credit outstanding) and minutes from the recent FOMC meeting.